Samsung, yesterday announced the release of its new midrange smartphone, the Samsung Galaxy Core Lite with the model number SM-G3586V. The device forms a part of the company's Galaxy Core lineup. Currently the phone is hitting the Taiwan market and there is no word on the release of it in other markets right now. The handset will worth around Rs. 15,800 in India. The device that works on a single Sim card is sold with Android 4.3 Jelly Bean operating system. This Java support smart phone puts forward a capacitive touch screen with a 4.7-inch TFT display. The picture resolution offered by the display is 480x800 (WVGA) pixels. It also spots a 4G LTE support, which is very rare in Budget phones. 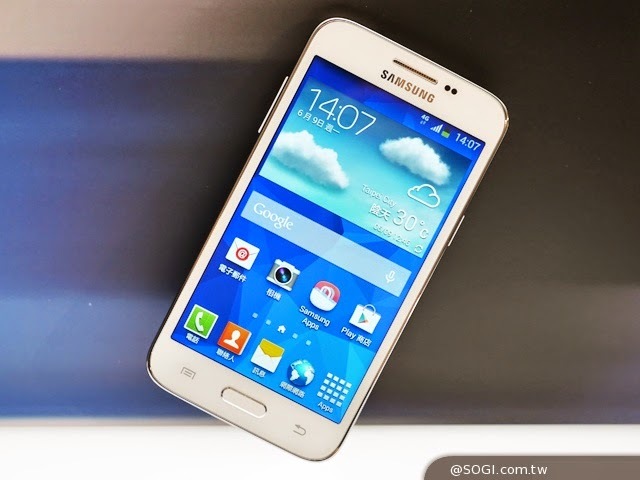 Packed up with 2000mAh battery the Samsung Galaxy Core Lite is driven by a 1.2GHz quad-core Snapdragon 400 processor, 1GB of RAM and an eight GB of expandable internal memory. By using a microSD you can store data up to 64GB. The handset which is devoid of a front camera has a 5 MP rear camera with flash option. When we move into its connectivity side, it presents Wi-Fi, Bluetooth 3.0, NFC, 3G and GPS connectivity options. Except the proximity sensor and accelerometer all other sensors are absent here. This white colour phone is surely going to have face to face competition with Asus’s new LTE Zenfone smartphones, LG’s F70 and F90. In the mid of this year, along with its expensive smartphones the Samsung is endeavoring to cater the taste of tight budget guys also….